As regular readers will have realized from my previous post, I have been on holiday in Prague, capital of the Czech Republic. I won't bore you with details of where I went or what I did, though I have made a few comments about the holiday over on my other blog. So I will just describe my ham radio experiences over there. Prague is quite a hilly city. 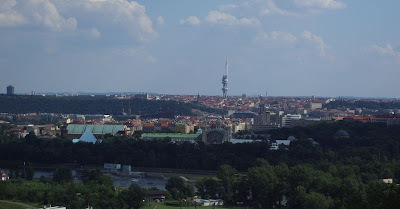 The picture above was taken from the Botanical Gardens to the north of the city, looking towards the famous Zizkov TV Tower. This building, looking from a distance like an Atlas rocket waiting to take an Apollo mission to the Moon, is widely regarded as the ugliest building in Prague. But from a radio point of view it would be a good QTH. I quite like it. Apparently you can go up it to see the view, but that is something we have yet to do. I took with me on my travels my Yaesu VX-8GR dual band APRS hand-held. Due to the language difficulty (I don't speak Czech) I didn't anticipate having many contacts with locals but I could see from aprs.fi that there was quite a lot of APRS activity in the city and I was interested to experience it first hand. I was not disappointed. From the moment the VX-8GR was first switched on the APRS channel on 144.800MHz began receiving packets. The station list, able to hold the 50 most recently received APRS packets, filled up in about ten minutes. I was receiving position reports from fixed stations and mobiles, not only in the Czech Republic but also sometimes from Germany, Poland and Austria. I also received local weather reports, including the position of lightning strikes over a more than 300km radius and weather bulletins sent out by OK1COM. Coming from West Cumbria where you can often go a whole day without receiving anything on VHF it was quite a revelation. I sent a greeting using APRS to Colin, 2E0XSD. By checking aprs.fi I discovered that he received it, but I didn't receive any of the acks his client sent back, nor his reply. It appears that no-one sets up their gateways to gate messages and acks for locally heard stations from the internet to RF, so the much-vaunted APRS messaging capability is essentially useless except between stations in direct radio contact. Later in my stay I did have a messaging QSO with OK1RQ on foot in Prague with a Kenwood hand-held. Unfortunately he was busy so I never got to meet him or any other local hams. I also received greetings via APRS from a couple of other local stations. We needed to make some local phone calls so I purchased a pre-paid SIM card from O2 for my smartphone. This included 3G data so I was able to try the APRSISCE client from Prague. I had several messaging conversations over the internet with Lynn, KJ4ERJ, the program's author. We also had our first voice QSO via OK0BNA, the Prague repeater, which Lynn was able to access through Echolink as it is connected to OK1OGA-L. I monitored OK0BNA on many evenings and heard only two other contacts take place on it. I did not hear any other FM contacts on either 2m or 70cm the whole time I was in Prague. APRS works well in Prague because there is a network of several digipeaters and gateways within a radius of a few kilometres of the centre. The apartment where we were staying was just a few hundred metres from the QTH of OK1ALX who runs a digipeater and Igate, so most of the APRS signals I heard on my VX-8GR inside the apartment with the stock rubber duck were S9+. The map on the right shows the tracks of some of our outings in the seven days before our return, tracked using the VX-8GR. Although aprs.fi reportedly stores position reports for a year, it doesn't appear to be possible to display tracks for specific periods retrospectively, and as I didn't have a computer with me (this was supposed to be a holiday) I couldn't capture my tracks at the time. But you can see at the top one day's walk in the Botanical Gardens, at the bottom a walk around Vysehrad, and in the middle a circular walk we made into the city centre and back along the river one evening. Tracking an outing from start to finish wasn't very convenient, or even possible, because the GPS wouldn't pick up a fix inside the apartment and I couldn't be bothered to stand around for 3 or 4 minutes on the street outside waiting for it to get a fix before we started. Hence the big jumps from where we were staying to where we started walking. We were on foot or using public transport and you would lose a fix whenever you got on the metro or a tram or went inside a building, and then have to wait to regain a fix when you came out. It was too much hassle. But when we were planning to just walk, it was interesting to see where my beacons were picked up, both from higher ground and from street level within the city. I didn't use the Windows Mobile client for tracking much at all (apart for one short evening stroll along by the river) because using the GPS reduced the phone's battery life to an unacceptable couple of hours. However I was impressed by the battery endurance of the VX-8GR. After reducing the beacon frequency to no more than one every two minutes and using the 2.5W power setting, it lasted all day with enough power left for a couple of hours receiving in the evening. This is particularly noteworthy considering that the power saver was disabled (as it needs to be for APRS usage) and the receiver was constantly receiving and displaying APRS data. If only the GPS was quicker at finding its position after switch-on it would be just about perfect. Like most hams, I guess, I always keep an eye open for antennas wherever I'm travelling. 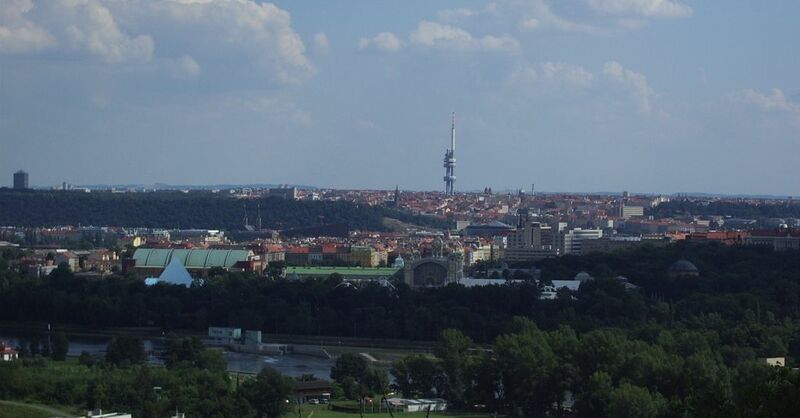 Antenna-spotting in Prague is quite difficult as every building has comprehensive lightning protection consisting of tall lightning conductors looking like VHF collinears, usually connected together along the ridge of the roof. I have never seen this anywhere else. Close to where we were staying, in a street called Vysehradska, I noticed a shop window displaying a few old radios, some vacuum tubes, what looked like a tube tester and some other electronic bits and pieces. On the roof of the building next door I spotted an MFJ multiband HF vertical antenna. I was sure that the owner of the shop must be a ham, so we decided to go in and introduce ourselves. Inside, the place looked more like somebody's untidy workshop than a shop. There were three elderly gentlemen, one of whom was presumably the owner. Another was leafing through a dog-eared book while the third was inspecting a vintage broadcast radio he had taken down from a shelf. They looked at us expectantly. I said "ham radio? ", anticipating that someone would understand at least that English phrase, but was met with blank stares and something we couldn't understand in Czech. Older people in the Czech Republic speak Russian, a legacy of the Russian occupation, so Olga then explained in Russian that I was a ham radio enthusiast and was interested in what they had in the shop. No-one introduced themselves as a licensed amateur, however. Instead, they told us that it was not a ham radio shop, but that there was one a few blocks away. Unfortunately Czech street names are confusing to non-native speakers, even to Olga. We didn't find it. Perhaps we will on our next visit. To see an arbitrary date's track at APRS.FI, click on the year under Select date: between the entry fields and teh Other SSIDs at the top of the right side. They've tracks for G4ILO-7 for various 2010 dates in July and one on 8/1. PS. Things have been busy here, so I never did get back to EchoLink. Sorry about that! Thank you, Lynn. There is a lot of stuff on that side of the aprs.fi map page and my eyes aren't that good, so I guess I missed it. Hopefully I'll now remember it for the next time I need it, though the memory is also getting flaky! I should add proper date/time entry for arbitrary time ranges in the real-time map, too. I already have the entry widget and it's used in the weather and telemetry pages. There's now a manual for aprs.fi, too, and the history lookup is described in the section looking up historical data. I'm often surprised by the fact that people don't really notice the history lookup feature at all. This includes active APRS users and digipeater operators I meet at the nearby ham club. I've been wondering how to make the selection menu more visible, but couldn't figure out anything that wouldn't be annoying.